One of Russia’s rising young stars, Nikita Vitiugov has recently cracked the top 20 of chess player rankings and isn’t looking back. From a young age, it was already apparent that he was going to be a star. He won multiple age category championships before being awarded his Grandmaster title and has continued to play well in many tournaments since then. With a tactical style of play, Vitiugov is sure to be a player to keep on the watch for. Nikita Vitiugov was born in Russia and had a lot of success at a young age. He tied for first in the U18 European Championship in 2005, won the U18 Russian Championship in 2005, and tied for first in the U20 Russian Championship in 2006 and 2007. These tournaments led up to him becoming a titled player when he became an International Master in 2006 and a Grandmaster in 2007. 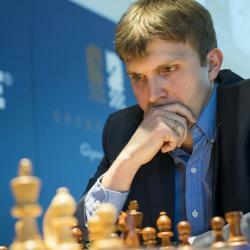 After being awarded the title of Grandmaster, Vitiugov cracked the top 100 ranking and became an elite player. He continued his winning ways, coming in second place at the Aeroflot Open in 2011, tying for first place at the Russian Chess Championship Higher League in 2012 and won the Tradewise Gibraltar in 2013. Now that he is among the top 20 players in the world, we know he will not stop until he has reached the absolute top of the chess world.